These example sentences are selected automatically from various online news sources to reflect current usage of the word 'prime rate.' Views expressed in the examples do not represent the opinion of Merriam-Webster or its editors. Send us feedback. The prime rate is the interest rate commercial banks charge their most creditworthy customers, which are usually corporations. Anyone who has borrowed money knows that different banks charge different interest rates. So when people refer to the prime rate, they are usually referring to the average prime rate among banks. The Wall Street Journal is one of the most common sources for this statistic. It calculates and publishes the average prime rate by surveying the 30 largest banks in the U.S.
Below you'll find a graph of the historical average prime rate published by the Federal Reserve, which surveys 25 banks across the nation. The prime rate is one of the most widely used market indicators, albeit a lagging one, and it is a major benchmark for mortgage and credit card rates. It is also often the basis for adjustable-rate loans. For example, if a bank is offering a home equity loan at "prime plus 5" and its prime rate is 6%, then the bank is essentially offering borrowers an 11% loan (6% + 5%) with an interest rate that will fluctuate along with the prime rate. It is important to remember that not everyone qualifies for a bank's prime rate -- this rate is only for the customers least likely to default. 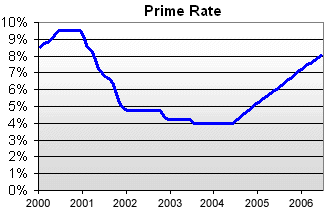 The prime rate is influenced (but not dictated) by the Federal Funds rate, which is set by the Federal Reserve. The Federal Funds rate is the rate at which banks can borrow from each other or the Federal Reserve in order to meet their reserve requirements. The higher this rate is, the higher a bank's prime rate usually is. What made you want to look up prime rate? Please tell us where you read or heard it (including the quote, if possible).